Product #18657 | SKU RODNT1KIT | 0.0 (no ratings yet) Thanks for your rating! 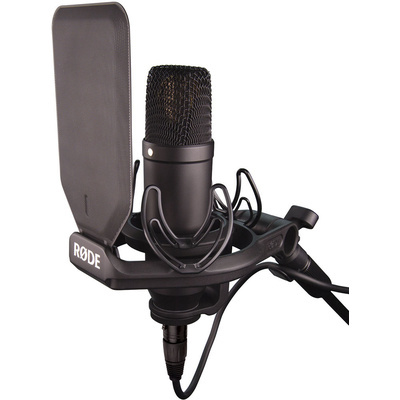 The NT1 Cardioid Condenser Microphone from RODE is a large-diaphragm cardioid condenser microphone that features RODE's HF6 25.40 mm capsule. The HF6 is designed to provide a detailed midrange response with smooth highs and warm bass. The capsule itself is seated in a Rycote Lyre internal shockmount to help reduce vibration and handling noises. The microphone's electronics were designed from the ground-up for quiet performance, and allow the NT1 to have a low, 4.5 dB of self-noise. The body of the mic is machined from nickel-plated aluminium that is then coated in a ceramic layer that is electrostatically applied for a scratch-resistant finish. The NT1 includes the RM2 mic clip and has a 1-year limited warranty that extends to 10-years after registration with RODE.